For all the ladies out there! Now, is the time to rise above the mundane and pamper yourself a bit with our exotic collection of stunning gold pendant. 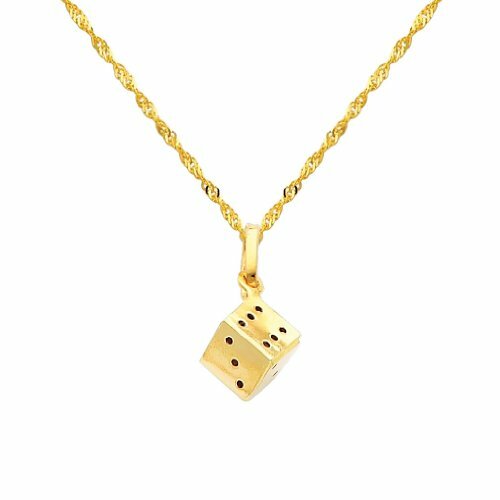 JewelStop brings you the most amazing pendant, the ones that you can pair up with all your beautiful outfits. These pendant have everything you are looking for making these the perfect statement pieces and symbolise eternity. These can be used in the form of a daily wear accessory and can also be worn on special occasions. So, wear these and get ready to be a style icon. 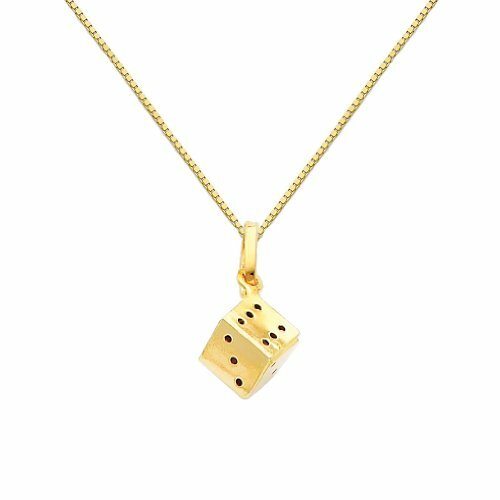 The gold pendant are made of 14k gold that have been duly stamped and marked as a sign of its originality. 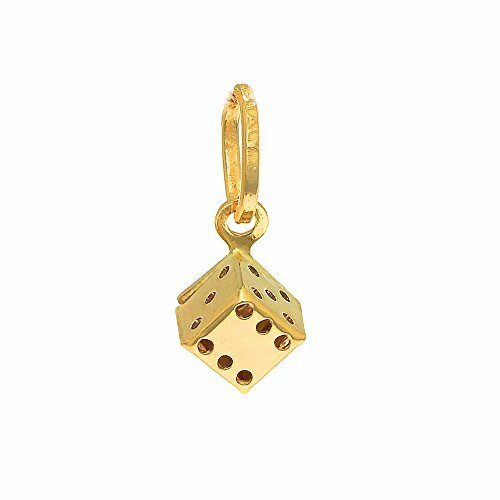 The pendant have been made of supreme quality material and we also vow a complete refund of your money within 30 days in case we fail to fulfill our promises. The package includes a gift box as well (domestic shipments only). So, wait no more and grab these amazing pair of earrings today! Please note that images have been enlarged to show better detail. 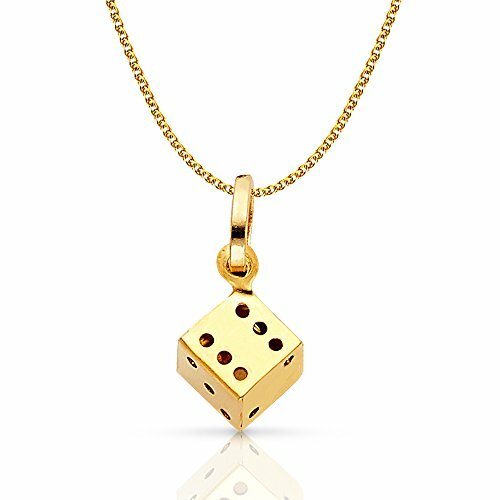 PENDANT SPECIFICATIONS: Brand: Ioka Model No: IG-01-100-0461 Type: Luck Attributes: Double Sided / 3D Stones: N/A Bale Size (mm): Metal: 14K Gold (Not Gold Plated) Average Weight: 1.02 GR Gender: Womens Good for: Chains, Charms, SymbolCHAIN SPECIFICATIONS: Brand: Ioka Model No: IG-01-900-0106 Type: Figaro Clasp: Spring-Ring Width: 1.6 MM Length: 16 inches Metal: 14K Gold (Not Gold Plated) Avg Weight: 1.34 GR Gender: Womens (Unisex)SHIPPING CONTENTS:-14K Gold Chain & Pendant-Jewelry Box-Warranty Certificate-Cleaning ClothLimited Lifetime Warranty: Complimentary repair service on manufacturing defects.Satisfaction Guaranteed: 30 Day return policy for all unworn items.Best in Class Customer Service: Business hours from 7am PT to 8pm PT every day, you can expect a response within 2 hours of emailing us. Outside of business hours, we will return your message within 8 hours. PENDANT SPECIFICATIONS: Brand: Ioka Model No: IG-01-100-0461 Type: Luck Attributes: Double Sided / 3D Stones: N/A Bale Size (mm): Metal: 14K Gold (Not Gold Plated) Average Weight: 1.02 GR Gender: Womens Good for: Chains, Charms, SymbolCHAIN SPECIFICATIONS: Brand: Ioka Model No: IG-01-900-0465 Type: Wheat Clasp: Lobster-Claw Width: 1.2 MM Length: 16 inches Metal: 14K Gold (Not Gold Plated) Avg Weight: 1.15 GR Gender: Womens (Unisex)SHIPPING CONTENTS:-14K Gold Chain & Pendant-Jewelry Box-Warranty Certificate-Cleaning ClothLimited Lifetime Warranty: Complimentary repair service on manufacturing defects.Satisfaction Guaranteed: 30 Day return policy for all unworn items.Best in Class Customer Service: Business hours from 7am PT to 8pm PT every day, you can expect a response within 2 hours of emailing us. Outside of business hours, we will return your message within 8 hours. 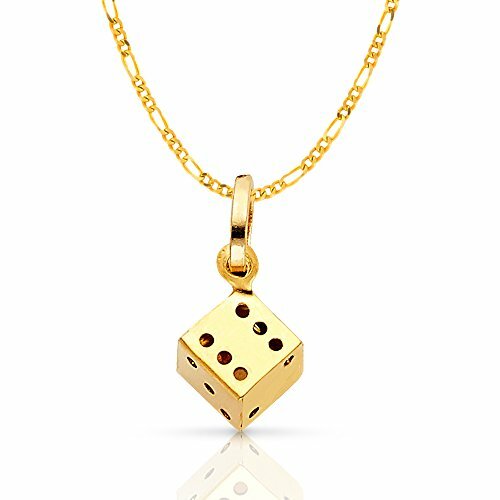 PENDANT SPECIFICATIONS: Brand: Ioka Model No: IG-01-100-0461 Type: Luck Attributes: Double Sided / 3D Stones: N/A Bale Size (mm): Metal: 14K Gold (Not Gold Plated) Average Weight: 1.02 GR Gender: Womens Good for: Chains, Charms, SymbolCHAIN SPECIFICATIONS: Brand: Ioka Model No: IG-01-900-0211 Type: Singapore Clasp: Spring-Ring Width: 0.9 MM Length: 22 inches Metal: 14K Gold (Not Gold Plated) Avg Weight: 0.83 GR Gender: Womens (Unisex)SHIPPING CONTENTS:-14K Gold Chain & Pendant-Jewelry Box-Warranty Certificate-Cleaning ClothLimited Lifetime Warranty: Complimentary repair service on manufacturing defects.Satisfaction Guaranteed: 30 Day return policy for all unworn items.Best in Class Customer Service: Business hours from 7am PT to 8pm PT every day, you can expect a response within 2 hours of emailing us. Outside of business hours, we will return your message within 8 hours. 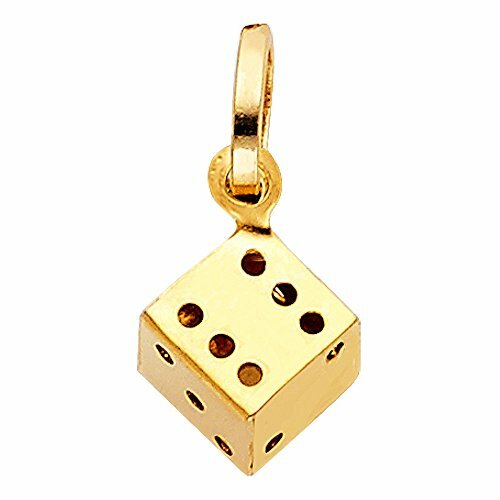 Looking for more 14k Gold Dice Charm similar ideas? Try to explore these searches: Logo Swim Trunk, Hallmarked Sterling Silver Cufflinks, and Beige Studio. 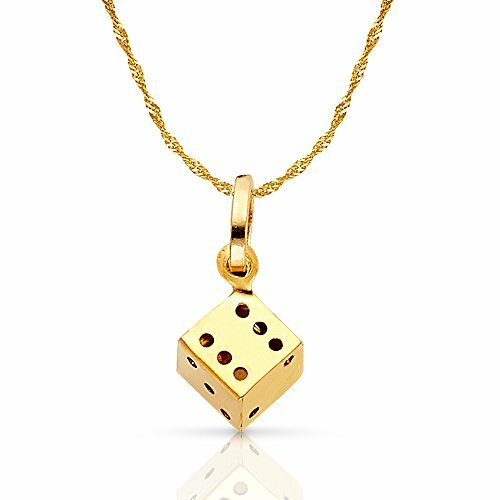 Mene Purchase - Pure 24K Gold Dice!